Time + Space is available now. 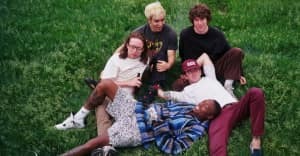 Turnstile released a double music video from two Time + Space cuts on Thursday, sharing the joint music video for "Bomb" and "I Don't Wanna Be Blind." The Atiba Jefferson-directed clip follows a group of teens on a sunny day as they sit on a stoop. As the songs transition from the smooth, electro-bop tone of "Bomb" to the fast-paced chaos of "I Don't Wanna Be Blind," the gang begin to chase an assailant in an old-school car, seemingly for running over a bundle of flowers one of the teens picked out earlier in the clip. The video ends with the group smashing the cars windows, laying orange-tinged flowers on top of the car, and lighting the vehicle up with bright red and orange flares, leaving a beautifully chaotic scene.